Romee Stridjd filmed her Victorias Secret Angel show prep and WOW | SHEmazing! When we envision the life of a Victoria's Secret angle, we picture the run up to show as a carousel of gruelling workouts, manic press appearances, skin prep and grumbling stomachs. While it certainly is a flurry of fittings, VS veteran Romee Strijd, from Amsterdam, has picked up her vlogging camera to document the week ahead of the show. Uploading the vlog to her self-titled YouTube channel, where she boasts a following of 650,000, the model showcased what the days before the show looked like, and how an angel prepares for her winged moment in the spotlight. Of course VS models are known for their slim, toned and ab-centric physiques, and while Romee self describes as skinny, she's definitely committed to her fitness ahead of the show. Most days during her vlogging, she hit the gym twice a day for one hour each time to do focused workouts. She attended her personal training at The Dogpound, one of New York's most renowned gyms for 7am work out sessions each morning. The Dogpound describe themselves as an 'exclusive yet unpretentious community of influential professionals who lead an innovative, wellness focused lifestyle,' so yeah, not intimidating at all. 'I like to work out before work because after work I am so tired so then at least I have my workout done for the day,' Romee quipped, though she did squeeze in evening resistance training most nights. She also did a session of EMS training – a method where a machine delivers electrical pulses that stimulate muscle contraction during a workout for that extra burn. We have to admire Romee for her gym commitment – it's a well known fact that VS models train like athletes in the lead up to the show so we can only imagine how tough it must be to remain so disciplined when it comes to fitness. As for her menu for the week leading up, the model kicked off her metabolism each day with a potion of hot water with lemon and apple cider vinegar. She then followed this with two breakfasts – first a protein shake or smoothie before her workouts, then second breakfast of oatmeal. Her regular oatmeal recipe saw the grain topped with blueberries and almonds. 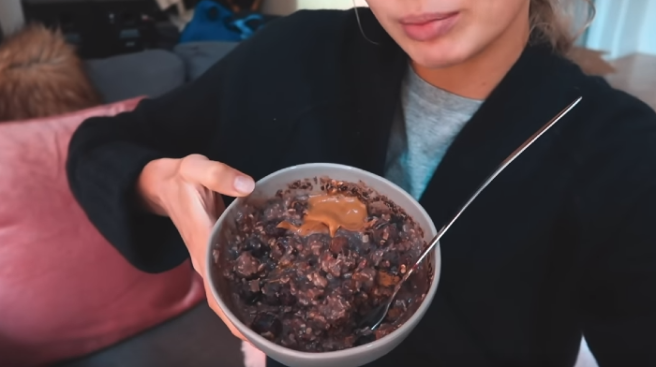 The Amsterdam native also imparted the importance of upping her protein while training for the show, and incorporated a swirl of vegan chocolate protein powder and a tablespoon of peanut butter into her oats – and to be fair it looked delicious. Romee also gave her vlog followers a sneak peek at her weekly grocery shop – she admitted that she loves eating out so meal prepping is her only option to stay on track. She also admitted to eating at least one avocado per day. The shop consisted of standard healthy fruit and veg including Brussels sprouts, aubergine, lean meats and good-fat-filled salmon. For snacks, Romee opted for carrots and hummus and salted seaweed packs. Not a crisp or dairy product to be seen. In fact, it looks like the model avoids dairy all together, choosing almond milk for her coffee and oatmeal. In her meal prep containers, the model devoured a small portion of brown rice, chicken or salmon, and a huge helping of hearty vegetables like carrots, sugarsnap peas and butternut squash. Romee did admit that she was getting pretty bored of her meal prepped foods, but incorporated some zesty ginger shots mid-week after feeling like she was coming down with a cold. Ginger has been cited as giving glowing properties to the skin, but Romee's pre-show skincare routine more glitters than glows. Three days before the show, the angel opted for a Mimi Luzon 24K Pure Gold Treatment in the skincare specialists New York branch. The treatment is known to lift and plump the skin, even out discolouration and add a glow. If you want in on the action yourself, you can order a one-off 24K Gold Mask from Barneys New York for a cool, €309.91. As well as rubbing gold leaf into her face, the model and co-angel Jasmine Stokes enjoy the ambiance of a salt room to help keep their skin clear. This was a completely new concept to us, but apparently natural salt caves have been keeping the skin of Eastern European natives clear since the 1830s. You dont find too many natural salt caves in NYC, so Romee opts for a man made one. All you have to do is sit back and relax for 40 minutes while the salt laden air does it's thing. Romee admits that the skin therapy literally makes you salty – licking her arm to demonstrate. Dublin has it's very own salt therapy cave in Clontarf if you're interested in giving the process a whirl.